The University of Indonesia has established the first medical education Museum in Indonesia. This museum is expected to be the reference of the national museum, a place of learning and education in the field of health and medical sciences. 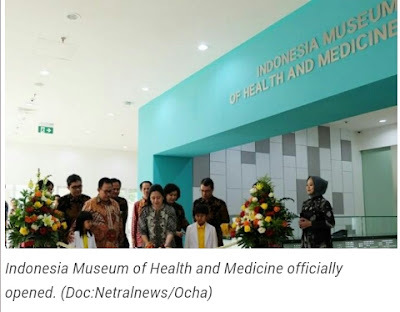 As reported by antaranews.com, this museum was named IMERI or Indonesia Museum of Health and Medicine, Faculty of medicine, University of Indonesia. "IMERI MEDICINE will become a new icon for medical education in Indonesia, the first in Indonesia," said the head of the public relations and Public information disclosure UI, Rifelly Dewi Astuti. This museum has more than 5,000 collections, in the form of medical specimens as well as relics (artifacts) of medical aids, videos, and media directories. There is also a 3D human visualization table, a new learning media that is first present and the only one in Southeast Asia. With the technological sophistication of 3D human body visualization table, it allows students to enjoy the learning process more concise and easy through the image of human body anatomy in the form of 3 dimensions. In addition, IMERI also provides educational support facilities for the health and medical community, in the form of health specimens collection from the Indies era to the modern era. The museum which located in the FKUI complex Salemba campus has six areas, namely Medical Education Journey in Indonesia (Chronological information medical education in Indonesia, starting from the era of Dutch and Japanese colonization, until the post-independence period). There is also Health Education (human life cycle information ranging from fertilization to advanced age, not only normal or healthy conditions but also exposing diseases/disorders that can occur in human life); Medical Collection (Detailed information on past specimens and equipment and anatomical table). Lobby (Information about DNA), Edutainment (Education area and simple information about the understanding of the human body and how to maintain personal hygiene), and Etalase (Area of ​​relics of educational and medical aids, such as laboratory equipment , operating aids, and educational aids). IMERI project was initiated with the hospital of State Universities at the Faculty of Medicine, Sebelas Maret University Solo and the Hospital of Andalas State University, West Sumatera. It is expected that IMERI-FKUI can become the center of inter-university collaboration in medical research and education for health in Indonesia. IMERI consists of more than ten health clusters. IMERI's flagship cluster is an infectious research cluster, a cancer research cluster, a cardiovascular research cluster, a reproduction research cluster, a human genetic research cluster, a stem cell research cluster, a drug development research cluster, a medical education research cluster and a simulation-based research education development cluster. IMERI is open to the public with the operating hours Tuesday - Friday at 09:00 to 17:00 pm and Saturday at 09:00 to 14:00. On Sundays and Mondays, as well as national holidays, the museum is closed.